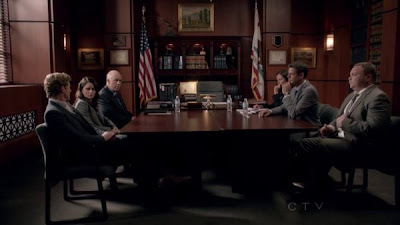 So the fifth-season ender of The Mentalist has come and gone, and my hopes are yet to be dashed! 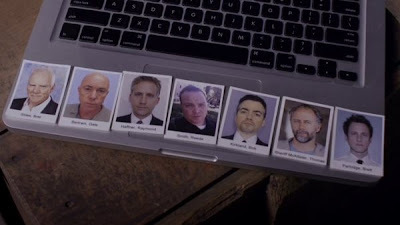 There was no revelation about Red John's identity, but we were presented with a short list, and my guy's name was on it. So now, like all armchair TV detectives, I think it's time to start wildly guessing at who Red John might wind up being. Here's the list we're given, along with my capsule comments. Gale Betram - Probably not. Ray Haffner - Absolutely possible. Bob Kirkland - Red Herring. Sheriff Thomas McAllister - Huh? Brett Partridge - My pick, for reasons I've already outlined. It's this guy on the right, the FBI agent from the beginning of season 5 who isn't Ivan Sergei. If Roy was notably stocky, it certainly would have come up in conversation with Rosalind - I don't know if Reede is muscular or soft, but he's definitely one or the other. 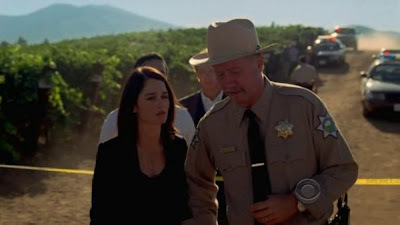 Beyond her description, though, he so profoundly doesn't fit the physical type of the Red John we've actually seen (twice) that it really can't be him. So let's just check him off the list. We can also eliminate Bret Stiles for the exact same reason - Malcolm McDowell is almost 70. He still cuts an imposing figure, but there's no way Rosalind couldn't have noticed that Roy was an old man. So that's two off the list immediately - almost three, given Gale Bertam's age and lack of hair, but I'm not willing to completely dismiss him yet. Although him busting out William Blake poetry apropos of nothing would tend to heavily suggest him as a red herring. There's a third that we can without much consideration as well, although not for an obvious reason: Bob Kirkland, first seen here in the 'eight years ago' flashback episode being conspiratorial. That's Patrick and Bob meeting and shaking hands for the first time. It's the last thing that happens in episode 507. Episode 508 is when Patrick breaks Lorelei out of prison. While her actual words are open to interpretation, the implication of what she says about Patrick and Red John shaking hands is clear - it was a passing, unimportant thing that happened some time ago. "I only wonder why the two of you didn't become lifelong friends the moment you shook hands." There's never a suggestion that Lorelei has been in contact with Red John since she's been in prison, let alone talked to him within the past week. So how could she possibly know that they'd met and shook hands? There's no way Bob fits into the timeline Lorelei establishes, so he shouldn't have been on the master list, let alone the short list. So now we're down the three 'real' suspects as I see it. Having expounded about Brett Partridge already, I'll move on to the other two - safe bet and wild card. Xander Berkeley is the wild card. I'll be honest, when I saw his name and picture laid out I was taken completely by surprise. 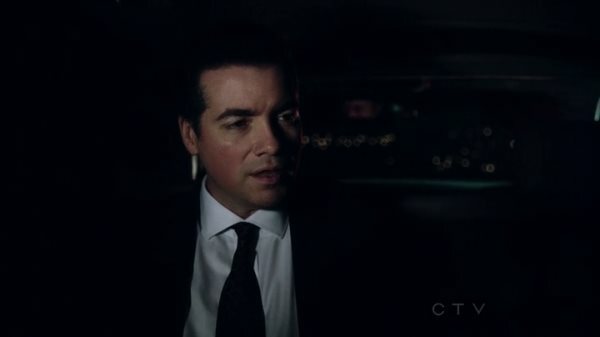 On one level I was shocked because I was expecting to see Walter Mashburn (Currie Graham) on the list, and the other because I barely remembered Berkeley being on the show at all. In case you don't remember his appearance, I'll clue you in - the second-ever episode of The Mentalist featured the fat guy from Modern Family as a would-be serial killer. Berkeley played the sheriff in whose town the mystery was taking place. Other than a moment when the audience is supposed to think he might be the killer in a fake-out, there's no reason to suspect anything is going on with the character beyond the surface. Beyond being a recognizable character actor, the reasons for his appearance on the short list are utterly baffling - which may actually be significant. Having scoured his one appearance for clue, I've come up completely dry - the only thing relevant about this character is that, unlike most of the names on the list, he first appeared in an episode written by series creator Bruno Heller. Is that particularly meaningful? Who can say - but like the fact that Brett Partridge was a named character in the pilot script, it's enough to give me pause and keep from ignoring this long-shot outright. So that's my analysis of the short list - just three viable suspects, any of whom could be the guy. Then again, it's possible Red John isn't on the short list, and the producers are just screwing with us. Which would feel kind of like a cheat. More importantly, though, my 'reading too-far-into-it' approach to character names got a bit of a boost this week - after all, why would Bret Stiles be first on the list and Brett Partridge be last if the producers weren't looking to put as little focus as possible on the fact that two recurring characters on the show have the same first name? It's a fascinating mystery, all right, and I look forward to seeing it play out over the next (and possibly last!) 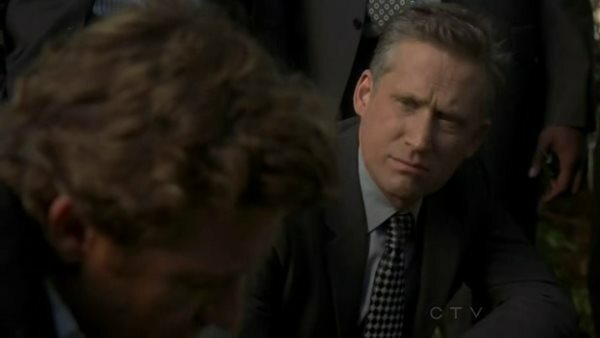 season of The Mentalist!